Visit us at AAPEX Las Vegas October 31 – November 2 | Eurol B.V.
Eurol will exhibit at Aapex Las Vegas from the 31st of October until the 2nd of November 2017. 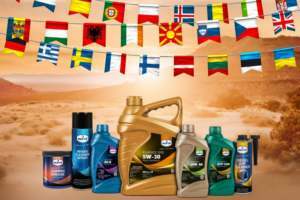 As the only independent lube oil blender from the Netherlands, we will show our complete range of premium quality lubricants. For nearly four decades we have been manufacturing and successfully offering a wide range of lubricating oils, additives, coolants, cleaning products and aftermarket additives. These products have been developed by our own Research&Development department, thoroughly tested to meet and exceed the highest quality standards. In booth 33001 on level 2 of the Sands Expo, you will meet our international account managers, who will be happy to welcome you and are most willing to inform you about our company, products and services. We look forward to welcoming you at our booth, where we can inspire you about the added value of Eurol Lubricants. AAPEX 2017, Sands Expo and Convention Centre, Las Vegas, NV, USA.